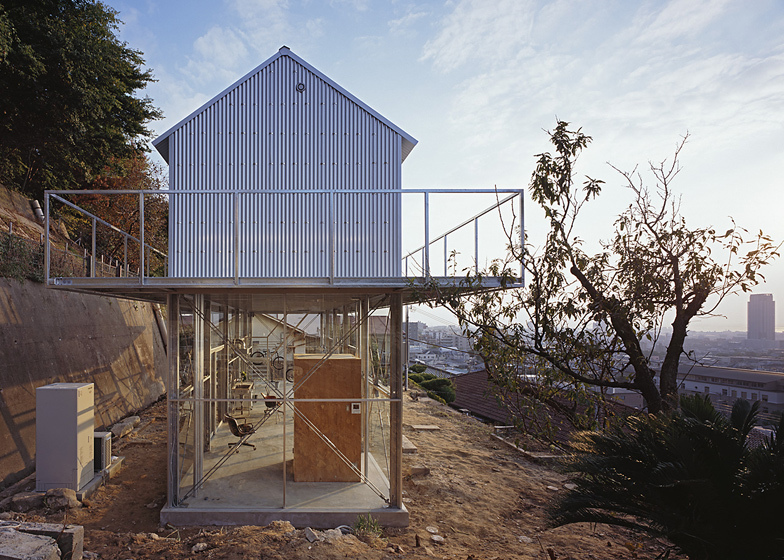 This hillside house by Japanese studio Tato Architects comprises a metal barn on top of a glass box (+ slideshow). 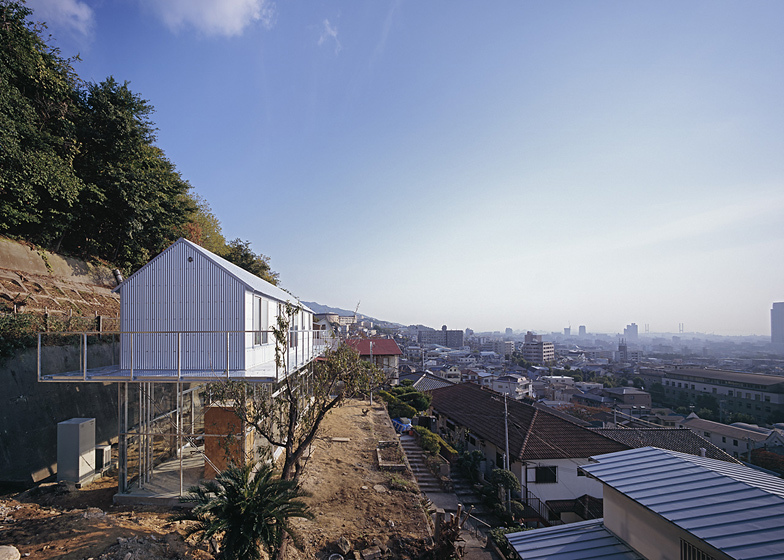 Located between a mountainous district and the harbour-side town of Kobe in southern Japan, the two-storey House in Rokko contains a kitchen and dining room inside its transparent ground-level storey. 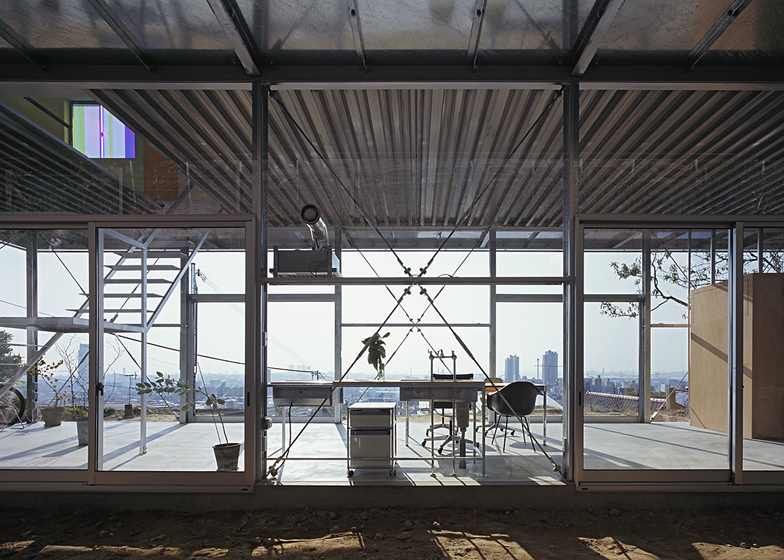 A balcony surrounds the gabled first floor, creating an overhang that shades the glazed facade below. 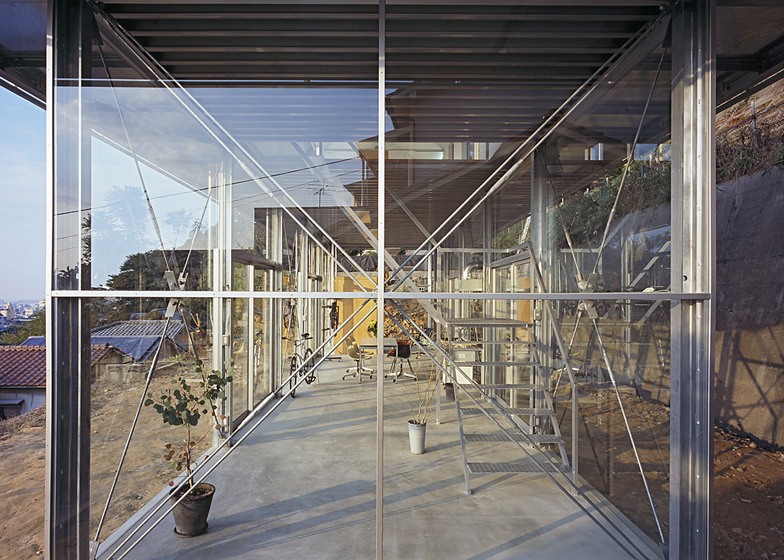 Upstairs, the bathroom is separated by a transparent glass partition. During construction, the foundations had to be dug by hand as no machines were able to climb the steep terrain to reach the site, while the streel structure had to be pieced together from sections small enough to be carried up one by one. We've featured a few houses in Japan with glazed bathrooms, including one with a garden behind its walls and one with a whole room dedicated to plants. Looking for the way an architecture does not fix the affect to the environment too much I have been somewhat anxious about what an architecture in a place commanding a fine view should be. It is the state of affairs freezing affect towards the environment. What is the way, while enjoying the view, not to be dominant to the environment? At an end of the residential area developed in the past halfway up Mt. Rokko the site was broad but too steep to bring in heavy machines for driving piles. A plane of 3.5 m by 13.5 m was left when a sufficient distance was secured, for manual digging for foundation, from the old breast wall and heaped soil. The site was not necessitating much anxiety about people’s eyes. As people’s eyes from below would not reach the first floor, the first floor was walled with glass all around so that the fine view could be commanded to full extent, which was equipped with kitchen and visitor’s toilet. 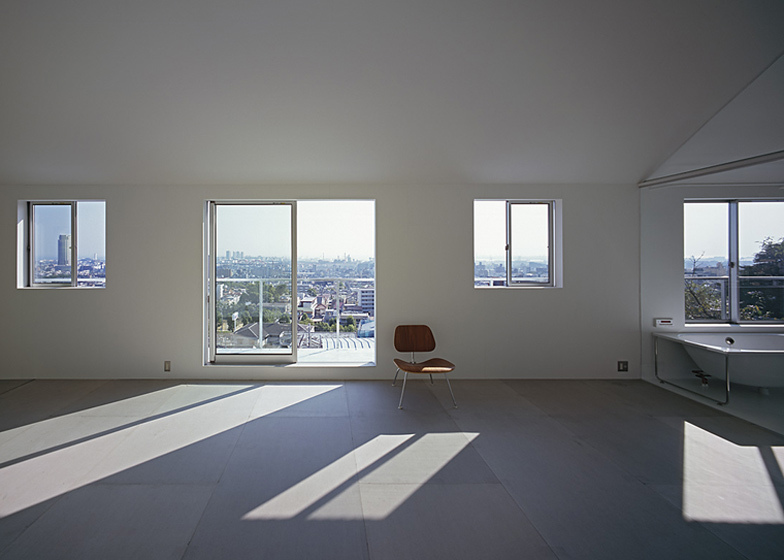 The first floor, while functioning as what is called LDK, was assumed to be used for such varieties of activities out of daily life as treating guests, creating music with friends, or taking care of his bicycles. 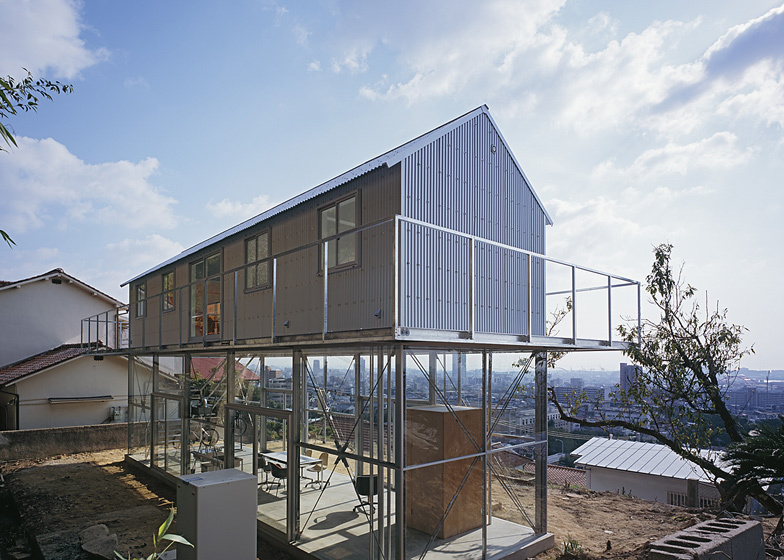 A bedroom, storing facilities, facilities using water were arranged on the second floor, which was leveled high with a roof of conventional appearance to join in the existing rows of old houses. 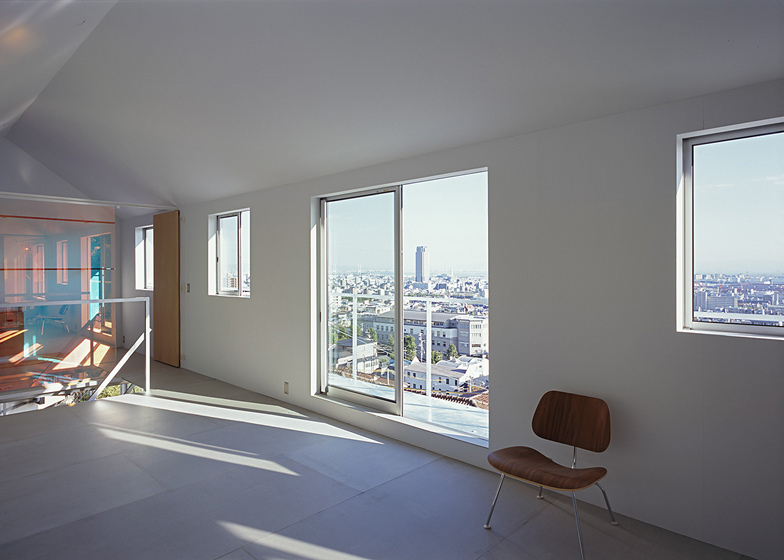 The high- leveled second floor was walled around with wide openings distributed equally for the ease of natural ventilation. Thermal storage system using midnight electricity was laid into slab concrete and on the second floor far-infrared radiation film floor heating system was supplemented. 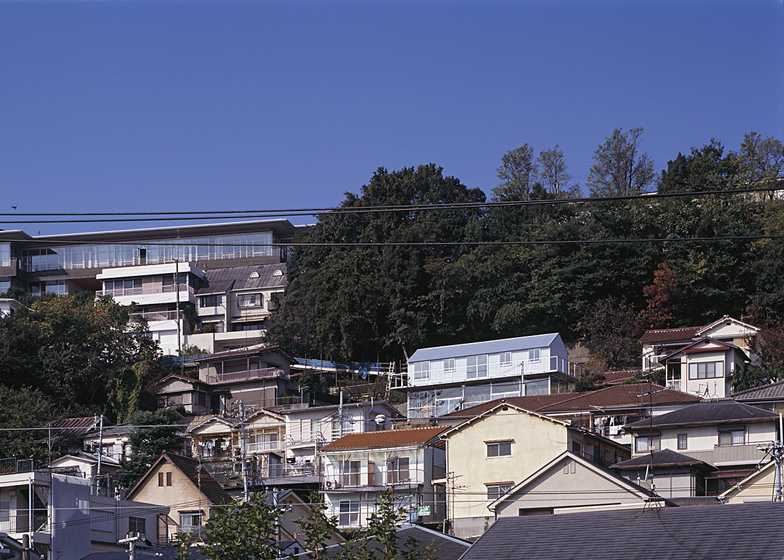 And in summer it is expected that balcony and eaves will block the sunlight and breeze from Mt. Rokko will carry indoor heat through. 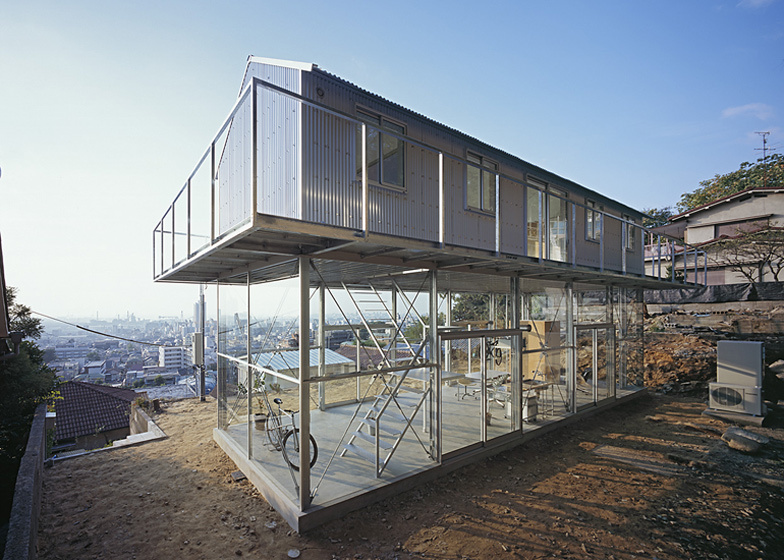 Steel-frame construction was adopted complying with the client’s wishes. 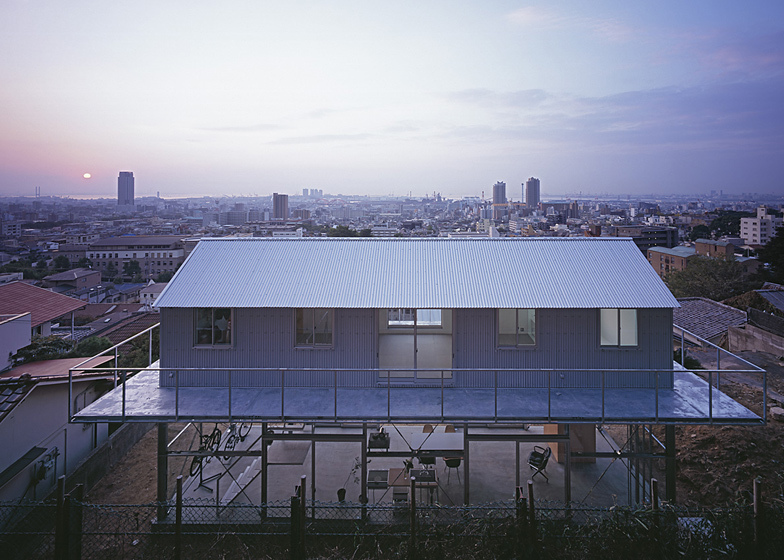 As physical labor was obliged, small 100 mm by 100 mm H-section steel was selected and each construction material was limited to weigh about 100 kg for carrying up to the site. Steel plate of 4.5 mm thick was laid for the cantilever balcony all around to make up for the loss of level structural plane caused by a large cutout of the second floor for stairway. Observing the environment carefully without responding downright resulted in this house of hollow bare mortar floor ceilinged high and walled around with glass. I feel I have found a way to cope, on an equal footing, with the environment peculiar to this scenic site where the environment, the architecture and the resident’s various things of various styles and ages are mingling with each other.